The wines of this estate, which traces its history back to 1547, are among the finest of Châteauneuf-du-Pape. 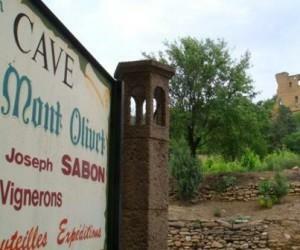 Run by the esteemed Sabon family, Clos du Mont-Olivet is made in a traditional style: partial destemming of grapes, crushing and fermenting in concrete vats, and aging in large foudres. Making wine is a family affair at Clos du Mont Olivet, and the three Sabon brothers -- Jean-Claude, Pierre and Bernard have run the domaine for the last 30 years, with Bernard's son Thierry gradually assuming winemaking duties, starting gradually in 2001. The wines are composed predominantly of Grenache (usually around 80%), with Syrah, Mourvedre and Cinsault completing the blend. The vines of this estate average over 60 years old. The 29-hectares of Chateauneuf du Pape that the domaine holds (they also have 17ha of Cotes du Rhone vineyards) is made up of many small parcels, spread throughout the appellation, that vary in size between 21 ares and 3 hectares. Montalivet is a walled vineyard to the east that surrounds the domaine and features the Sabons' oldest vines. Since 1990, these grapes have formed the basis for the deluxe "Cuvée Papet" – an amazingly concentrated and complex Châteauneuf-du-Pape. Further north, Le Pied-de-Baud contains "galets roulés," the large oval rocks for which Châteauneuf-du-Pape is well-known. Although the vines here are younger, the spherical stones reflect the intense southern-Rhone sun, thereby ripening the grapes to full maturity. The third primary section of vines, located to the south, is known as Les Gallimades, a plot of smaller stones and gravel with excellent drainage. Blending wines sourced from these three areas, the Sabons fashion complex Châteauneuf-du-Pape that combines the fruit intensity and alcoholic strength of Grenache with a slight and appealing hint of rusticity. It only makes sense that such a renowned Châteauneuf producer would also make fabulous Cotes-du-Rhone, which indeed they do; year after year, these are among the best Cotes-du-Rhone values to be found. Wine Spectator 93 "Solid, with a ripe core of raspberry and plum pâte de fruit flavors that sparkles with detailed anise, apple wood and sweet tobacco notes. Has weight and depth, but the acidity is fresh, allowing this to stretch out through the finish. Best from 2019 through 2030. 900 cases made. Robert Parker 96 "The explosive, pedal-to-the-metal, super-duper 2007 Chateauneuf du Pape La Cuvee du Papet has an even darker ruby/purple color, with a glorious intense nose of roast meat and Provencal herbs interwoven with kirsch, black currant, loamy, earthy scents, and some pepper and spice.